I wanted to do a sort of 'review' post, asking you all your thoughts on the past month's content and giving my view on how it's been. 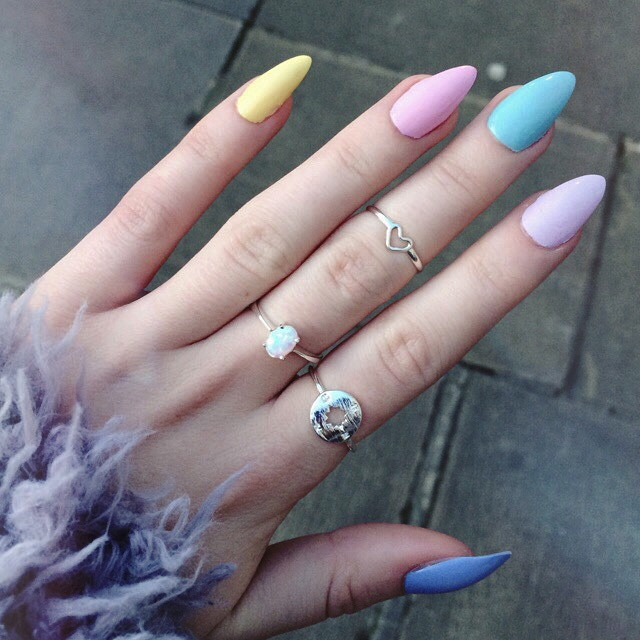 However, I couldn't just do that as it'd be boring, so here's a photo of the pretty pastel rainbow nails I'm currently sporting too! Blogging every day hasn't been anywhere near as hard or as stressful as I expected, especially as I quite often scheduled a number of posts in one day. Above all, I think I really pushed myself with outfit posts and managed to publish 10 this month, I'm really pleased with that and maintaining that level is something I hope to continue doing. On the other hand, there were a few times when I blogged something just for the sake of it and being the perfectionist that I am, wasn't 100% happy with the content/photos. Being a full-time student as well as acting like a full-time blogger was at times quite difficult, so often I would run out of time to create the content I had originally planned. I was far too stubborn to not complete this challenge, so there were a couple of instances where I published the posts anyway, despite knowing I'd ultimately regret having poor quality content on my site. Going forward, I definitely think I'm going to blog more than I used to before, but it's unlikely to be every day. I'd much rather aim for every other day as I think that's more realistic for delivering quality, creative content that I can put a lot more thought into. So yeah, I was just wondering what you all thought of this month's blog posts? Would you rather I continued blogging daily? i loved all your outfit posts! also your nails are the perfect shape!! Love that little gem ring...really pretty!